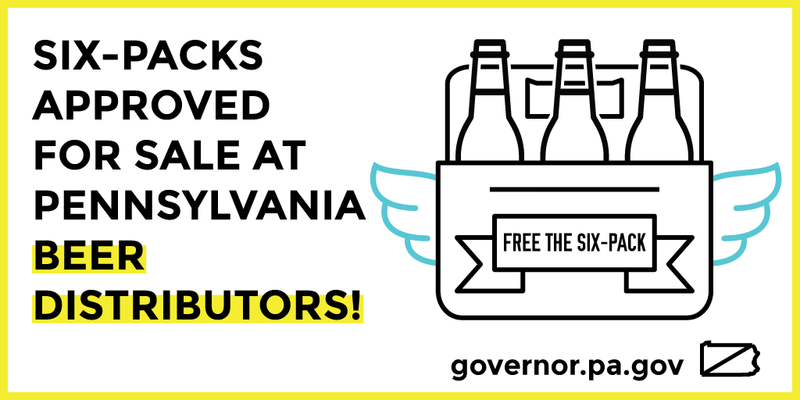 Harrisburg, PA – Today, Governor Wolf signed HB 1196 which will allow six-packs to be sold at beer distributors to further “free the six-pack” and improve customer convenience. In May, following Governor’s Wolf’s request, the Pennsylvania Liquor Control Board approved licenses allowing gas stations to sell beer. These approvals freed the six-pack for certain gas stations with appropriate accommodations that can now to sell six-packs of beer. Allowing distributor licensees to sell malt or brewed beverages in any amount to a unlicensed customer for off-premises consumption. The sales do not be in the manufacturer’s original configuration and can be sold in refillable growlers that can be resealed. Allowing retail licensees to start selling on Sundays at 9:00 a.m. instead of 11:00 a.m. Allowing a person licensed by another state to apply for a “malt or brewed beverage shipper license,” which allows the direct shipment of 192 fl. oz. of beer to be delivered to a customer per month; however, only 96 fl. oz. of a specific brand of beer may be shipped per year to an adult resident. Allowing beer and liquor to be sold (in shatterproof containers) before, during and after professional and amateur athletic events and consumed outside the club seating and restaurant area, as can be done at performing arts events or other entertainment events. Clarifies that a brewery does not need a brewery pub license to sell the products of other licensed breweries, limited wineries, limited distilleries and distilleries.